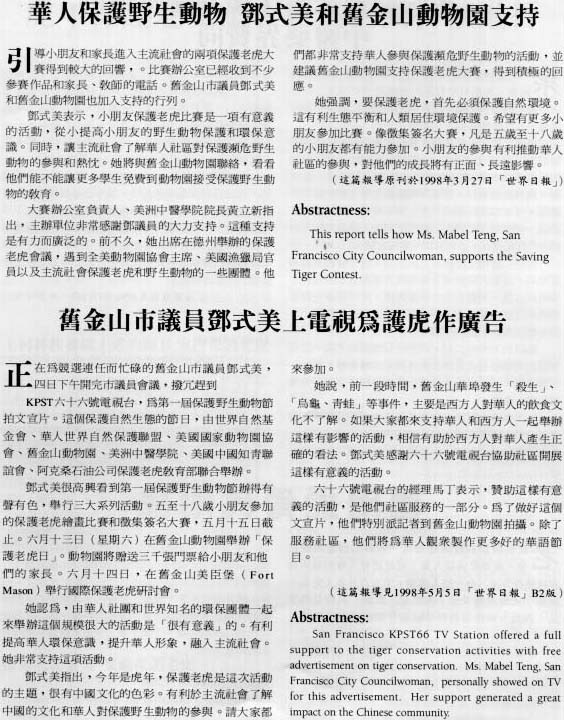 This report tells how Ms. Mabel Teng, San Francisco City Councilwoman, supports the Saving Tiger Contest (First article). San Francisco KPST 66 TV Station offered a full support to the tiger conservation activities with free advertisement on tiger conservation. Ms Mabel Teng, San Francisco City Councilwoman, personally showed a TV for this advertisement. Her support generated a great impact on the Chinese Community (Second article). Previous article : The opening of the Tiger Painting Contest for Children. Next article : U.S. Congress. Using Tiger Substitutes.